HCVKC7 steam conditioning valve combines pressure and temperature control in a single valve, and is commonly used in process steam systems if the high level of tuning is of extreme importance. HCVKC7 is an angle valve. 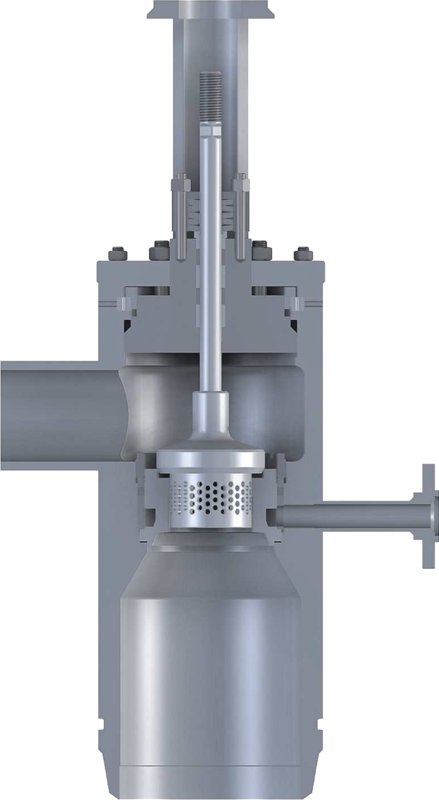 It incorporates a spraywater manifold and atomizing steam implementation downstream of its pressure reduction stage. The forged body has self-sealing inner bonnet with trapezoid gasket. The slip-in seat (pressed by screw plug) has injection nozzles in its lower part. To atomize water droplets they employ the steam from pressure- -reducing portion of the valve. These smaller droplets permit the water to remain suspended and its almost immediate absorption by the steam’s stream. The water injection takes place far from mobile parts of the valve, what results in prolonged MTBF. A medium undergoes single-stage expansion by means of perforated plug. Atomizing steam reach the nozzles during first stage of valve’s opening. HCVKC7 valve works with media flow directed over the plug. Its construction allows to increase the number of expansion’s steps (additional appliances are assembled on the outlet connection pipe). Any control of coolant’s flow demands an implementation of additional injection valve. Tylko zalogowani użytkownicy mają dostęp do rysunków technicznych. Tylko zalogowani użytkownicy mają dostęp do modeli 3D.